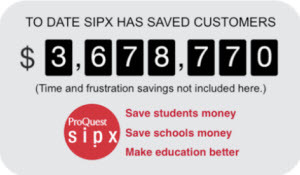 Innovative libraries are using SIPX solutions to achieve success for their campus. “Not only does ProQuest SIPX create significant efficiencies in our e-reserves workflow, but in one semester the service saved the Hesburgh Libraries more than our annual cost to use the tool,” said John Wang, Associate University Librarian at University of Notre Dame Hesburgh Libraries. Now institutions have more options to reduce education costs for students and improve efficiency at their campus. ProQuest SIPX has launched three new innovative digital course materials. Designed to support institutions in what they do best, SIPX Central, SIPX Campus and SIPX for MOOCs are scalable, configurable, flexible solutions so that schools can focus on delivering high quality education. • Students typically save 20-35 percent in course materials costs. • Instructors have more visibility to relevant content that is available at no charge to students when they assign curriculum readings. And, SIPX’s useful analytics enable them to see students’ engagement with their reading assignments. • Administrators and Deans can optimize and streamline their campus operations while driving student success, supporting quality curricula and lowering the cost of education. • IT Directors can easily integrate SIPX into their existing LMS and teaching platforms with SIPX’s cloud-based technology. • Instructional Technologists can leverage a fast and easy copyright and content tool to support all types of teaching, including online education innovations and MOOCs. • Librarians get more use out of their collections investments and more insight into the content their campus needs for teaching and online education. For more library success stories and how the new course materials are supporting unique teaching and learning workflows, read the full news release. Check out our the proven case studies at www.sipx.com.